Shopping for Ramones Action Figures? Pay tribute to this legend! Just the thing for any Ramones fan! From his earliest performances at CBGB to his untimely death in 2001, no musician personified punk rock like this unforgettable front man. 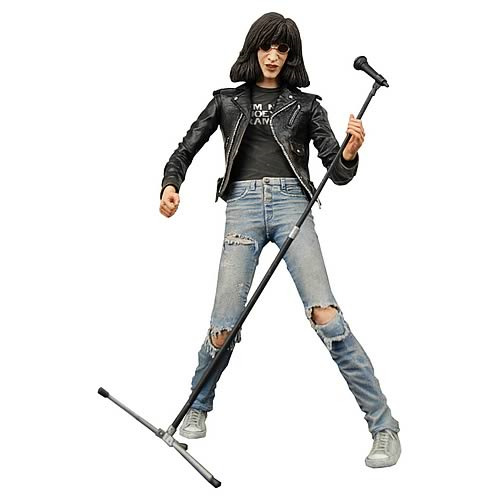 This 7-inch plastic action figure features Joey Ramone in his trademark leather jacket, sunglasses, and "I'M NOT JOEY RAMONE" t-shirt. Realistically detailed and articulated, he also comes with a microphone stand. You may "Wanna Be Sedated" or "Beat on the Brat" if you don't order this!